Planning a retro pink bathroom from scratch is not an easy task: As you well know, pink tiles are hard to find and then, all pinks are not created equal. My quest for pink tile feels similar to the story of Goldilocks and the three bears — except it’s Kate dipping her hungry spoon in pink bathroom tiles. Sure enough, I found that deciding on the right pink was tricky — some were too bright, some were too purple. And like anything else, it depends on personal taste to determine which pink tiles may be the *right* pink tiles for your bathroom design. What follows is my personal quest. I ordered up a bundle of samples from all the places I could find — and then began to mix, match, compare and contrast until, yes, all I could see was pink! The quest began with 4″ x 4″ wall tiles — using Pam’s post 12 places to find 4×4 ceramic bathroom tile in vintage colors as my reference starting point. First on the list was requesting samples from American Universal Corp. — who seemed to have two different pink shades. At $7.95 per sq. ft., these tiles are a relatively affordable option. 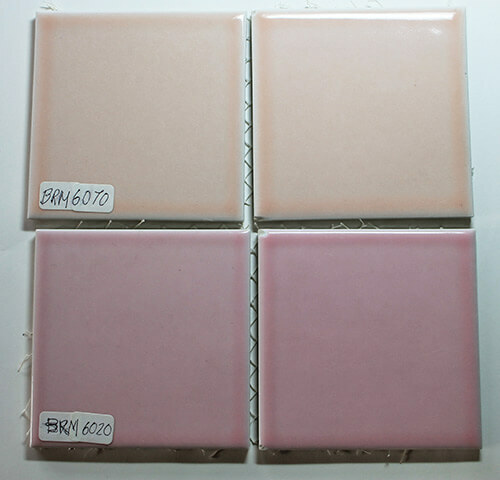 The BRM – 6070 (above, top) is more of a peach pink, but is close to what I was looking for. I had high hopes for the BRM – 6020 (above, bottom) color, but in person it was more purple-pink than I had in mind for my bathroom remodel. American Universal also had several pink mosaic options such as their 1 inch mosaics. These retail for $9.95/sq. ft. The top right mosaic, DOT-91, again was more of a peachy pink. It coordinate well with the BRM – 6070. Meanwhile, the DOT-94 (bottom) is a pink with a more purple hue, similar to the BRM-6020. Note: I also found that Mosaic Tile Supplies carries the exact same tiles (shown overlapping the DOT tiles from American Universal above) Blok 191 and Blok 194 for $11.95/sq. ft. Both American Universal Corp. and Mosaic Tile Supplies also carry glaze and unglazed hex tile that appear to be the same tiles. The unglazed tile (top) was once again a little too purple pink for my liking. I did like the bottom glazed hex tile — which coordinates well with American Universal Corp.’s BRM-6070 peachy pink 4×4 tile. The unglazed hex (LGH-207) retails for $10.95 at MTS and $8.95 at AUC (SX-207). The glazed hex (SX-10) at AUC is $8.95/sq. ft. and (LGH-10) $10.95 at MTS. 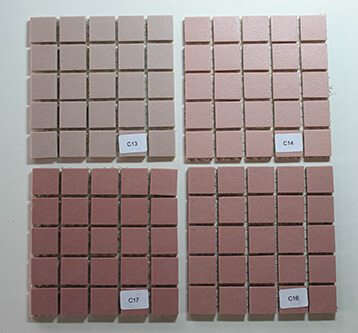 I ordered samples of AUC’s pink penny round tile, but for some reason they weren’t sent in my sample pack. I can assume, though, that they would be the same as the samples of penny round from MTS (shown above) since it seems both companies get their tile from Japan — quite possibly the same manufacturer. Above left is MTS LPR -0307 which may be the same as AUC BRP-3070 and has a peachier tone. The sample on the right is LPR-0302 from MTS or BRP-3020 from AUC. AUC comes in again with slightly lower prices at $8.95/sq. ft. for penny round while MTS sells them at $11.25/sq. 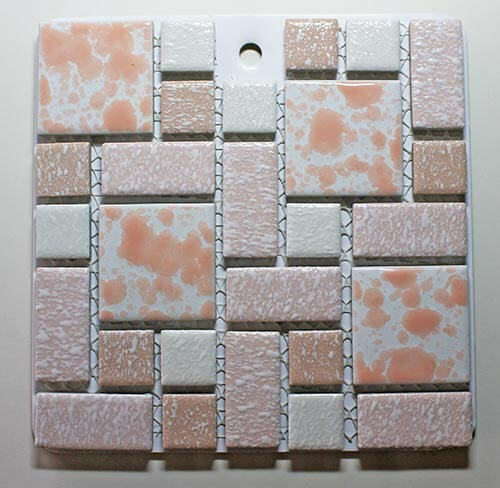 ft.
Mosaic Tile Supplies does have 3/4 inch square unglazed mosaic tile in varying shades of pink (shown above) which would be good for a shower or bathroom floor. Top left is C13 Flesh (5.73/sq. 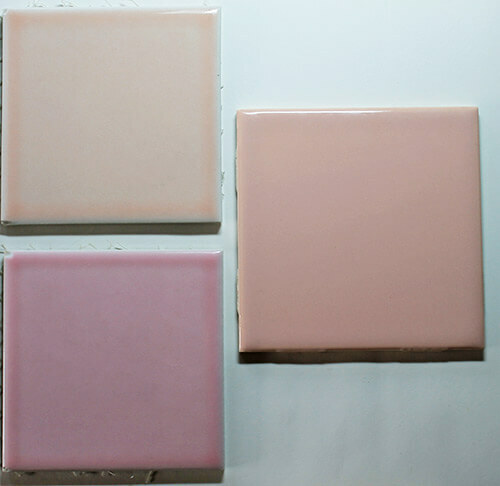 ft.), top right is C14 Rose Pink ($4.74/sq. ft.), bottom left is C17 Romance ($4.74/sq. ft.) and bottom right is C16 Antique Rose ($4.75/sq. ft.). Next on the list was Daltile. 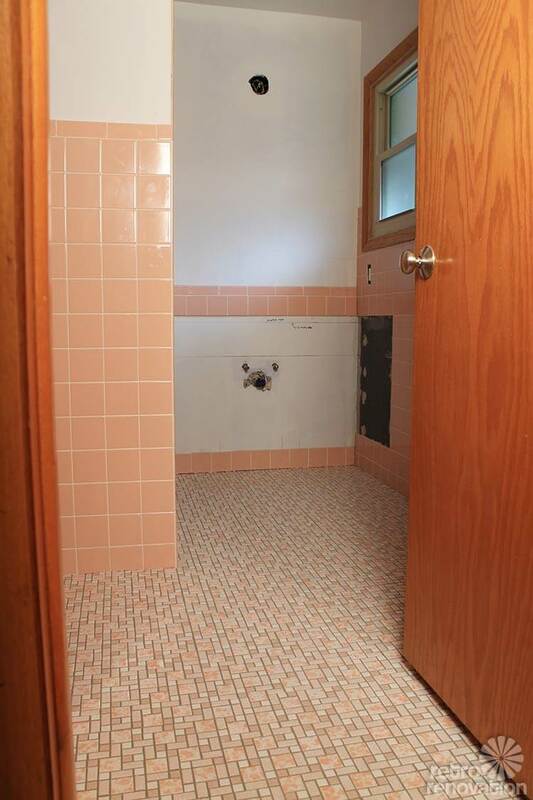 They have one 4″ x 4″ pink glazed tile (Q095 – Carnation Pink at $7.44 sq ft.), which was simply too dark for the retro modern bathroom remodel I had in mind. I did like their mosaic tile tool which allowed me to make the pattern to the right with their Carnation pink unglazed tile and Carnation Speckle unglazed tile (plus Arctic white unglazed). At $9.75 sq.ft. it is a custom tile blend with a relatively affordable price. 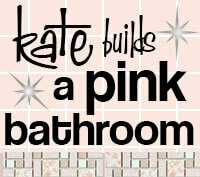 Still, I wasn’t sold that it was the right color pink for my bathroom design. Janice used B&W pink tile in her bathroom. 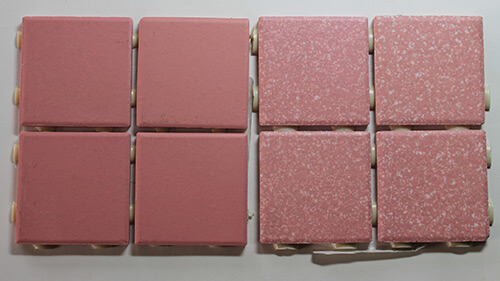 Just when I was starting to lose hope that I would ever find the right pink tiles, my sample from B&W Tile arrived. 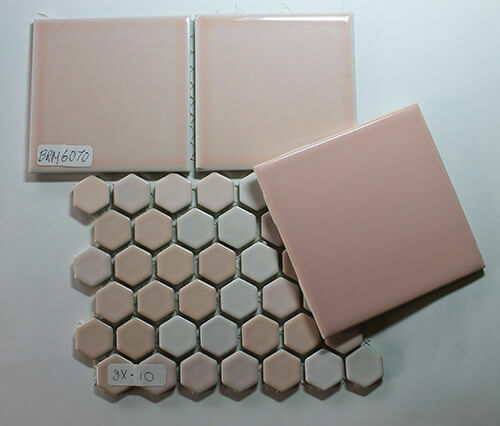 Shown above (right) next to the samples from AUC tile, the B&W 70W pink tile is the perfect color pink I had in mind. It is just the right shade of pink for a vintage bathroom remodel — which makes sense because B&W has been making these tiles for 60 years right here in the USA — where pink bathrooms began. At $4.09/sq. ft., B&W’s pink tile is a great price and just the color I was looking for. Note: Reader Janice used just this shade of B&W pink in her bathroom remodel — it looks great! My next problem became deciding what to use on the floor that would coordinate with the perfect pink B&W tile. The Carnation Daltile didn’t quite work for me — the pinks were too different. 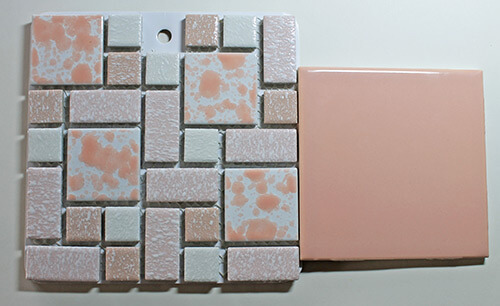 Next I tried the B&W pink tile with the glazed pink hex — I think this could work, but I wasn’t in love with the option. 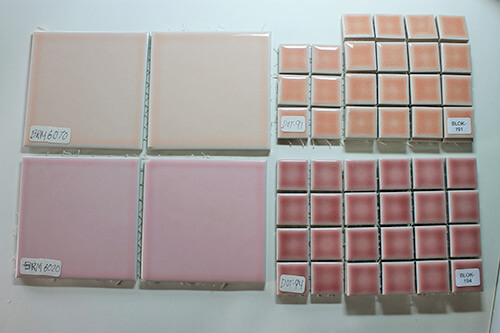 I tried to get a sample of the Text Pink from Nemo tile — but I was sent totally different tile samples instead. I did find out that the price is $5.95 per sq.ft., but have yet to get an actual sample to look at. 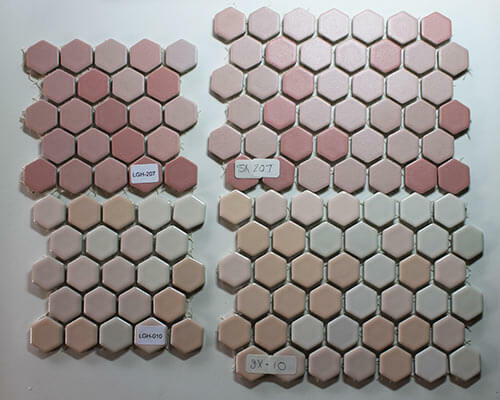 Then, in a frantic online search for more pink tile options, I discovered Merola Tile’s University Pink. 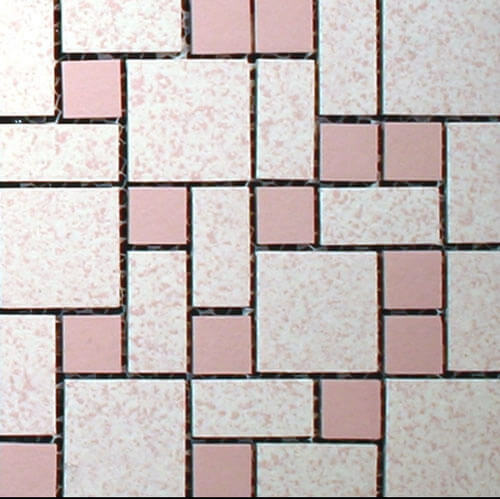 Available at the Home Depot at the relatively affordable price of $9.26/sq.ft., this retro looking pink tile just might be the ticket. 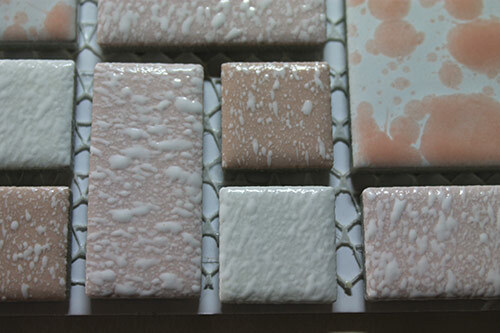 I got my hands on a sample and found it coordinated beautifully with the B&W pink tile. By golly — my Goldilocks search for pink tiles may be at an end. 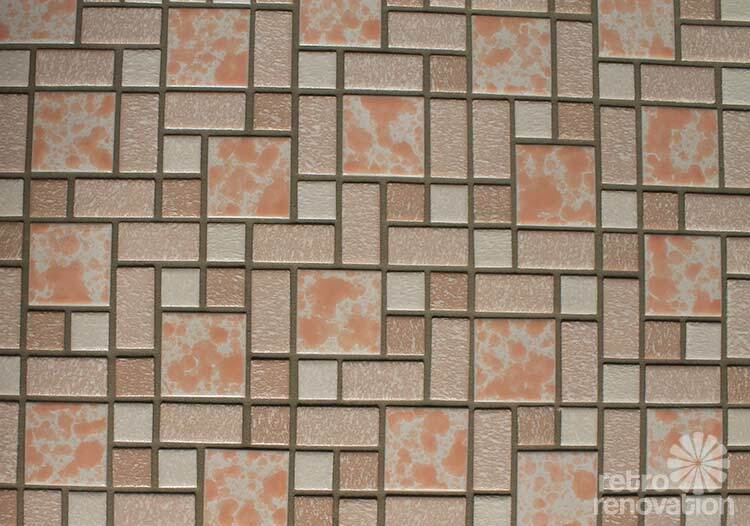 The B&W 70W pink and Merola Tile University Pink look to me to be a retro match made in heaven. I’d still like to see a sample of the Nemo Tile Text Pink in person before I make my final decision — but at this moment my mind is made up. We bought our home last year, original everything I think. The bathroom is pink 4X4 tile two thirds up the wall, the floor is pink and white 1X1 tile. We are thinking of gutting because it’s in bad shape. The wall tiles are in excellent shape but the floor is pretty wasted. Tub, sink and toilet are white.